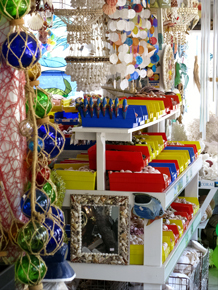 The Florida Shell Shop on Treasure Island FL is a great choice for finding cheap wedding decorations for your Florida beach wedding. Florida shells are colorful, elegant, and inexpensive. The nice thing about a beach wedding here on the Gulf Coast is that the setting is so beautiful, you do not really need to add much. Brides wear cute, short sun dresses , no veil (because of the wind by the ocean), take their vows barefoot, and invite a small amount of guests. More and more young couples are getting away from overblown, gaudy church ceremonies and opting for a cheap beach wedding. Decorations and favors can be inexpensive and classy when you use natural elements from the environment. Sea shells cover this well. 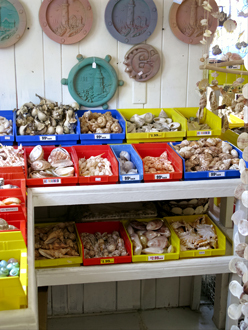 Located on the east side of historic Gulf Blvd just north of Sunset Vista Beach , the Florida Shell Shop takes pride in being the oldest shop on Treasure Island. Opened in 1955, it is a far cry from the many t-shirt shops that line Gulf Blvd from Clearwater Beach to Pass-A-Grille Beach . New owner, Patrick Elias, is a young guy willing to help couples find exactly what they want to make their reception (usually held at Sunset Beach Pavilion ) look classy without spending a huge amount of money. "We will definitely work with the family on pricing. As a matter of fact, we have a standard wedding discount," he said. "We can recommend inexpensive shell items that work great for both wedding decorations and mementoes of the ceremony." A quick tour of his shop will validate that. There are varieties of small, colorful shells ranging from 59 cents...up to $1.99. Larger shells, of course, are priced higher. The shop is small, the wood floor is weathered...and everything is easy to find. Shells are displayed in colorful bins and the price is easy to see. The tough part will probably be deciding what not to use. If you are truly interested in cheap wedding decorations for your Florida beach wedding, you can present a classy effect for a few hundred dollars. There is no need to spend $1000's of dollars on flowers that will wilt in the humidity and ice sculptures of dolphins that will being melting the minute they are set out at your outdoor reception area. Also, does your family really need to spend $1000's of dollars on favors like monogramed iPods, when you can give each guest a unique natural gift from the ocean? Before you are talked into anything by a so-called "wedding planner", come visit Patrick at his store. I think you will have a whole new outlook on budgeting for your cheap Florida beach wedding.